Last edited by Hugh Salamando Filth on Fri Dec 21, 2018 1:03 pm, edited 11 times in total. Its not much, but we use it in our roll20 play. Well, nice effort, but that map is massively incorrect. It shows various Segmenti of the galaxy. W&G doesn't introduce a sector, but a system. 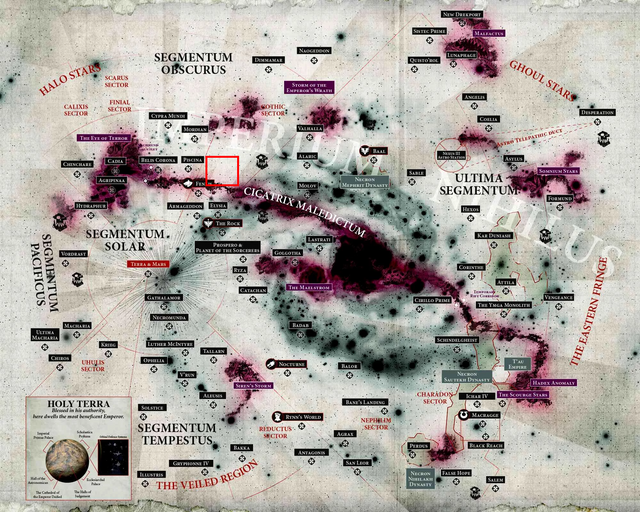 The planets shown on your map, which are strewn across the galaxy within multiple segmenti, are supposed to be in one solar system. Your image suggests the Great Rift snakes through the Gilead system. Sorry to break it to you, but your map makes no sense at all. According to the core book the system should be somewhere within the red square. Yeah well, if you find a map that is accurate to the last detail ... just post it here. BanaB wrote: Yeah well, if you find a map that is accurate to the last detail ... just post it here. I'll probably just go find a solar system creator (i know such things exist) next week and build up a map myself. First post updated with self-made map. Though I need to add Charybdon to the the map. Introduced with Dark Tides. Forgot about it. Also, I'll add some more data to the planets. Like how long is a day, how long does it take to go around the sun, etc. Will be done next week.